Just curious why do you use SLED ? notebook is SLED 12 and Windows 7 uefi, non secure boot. even use anymore...but there for testing if need be. Has the end-point of your link been hijacked? When I click on the thumbnails you provided, I go to a page that appears to be where you posted the images, but with the images reduced in size and clickable, supposedly to take you to a high resolution image. Instead, it takes me through various questionable advertising items to what appears to be a page selling videos or something ... do not really know, as I killed it before looking at it in detail. Never did see the high resolution of your images. At that page where images where posted, if I click on an image the firefox popup blocker tells be that it blocked a popup. And I do see the image in full size. I'm guessing that the advertising is on the popups that were blocked here. Aha, it's "noscript" that keeps out the advertising. If I tell it to allow scripts globally, then I see some kind of health ads. If I only allow the scripts for the image site (plus the ones that I standardly whitelist), then I see the images and can get full size, without ads. ... as soon as you said that, I was immediately suspicious. Instead of following the link you provided, I tried it again. Same thing. I was redirected to another site altogether. I immediately closed Firefox, stuck in one of my backup USB keys, and restored my entire Firefox profile from the backup. Launched Firefox, tried again, problem gone! Firefox somehow became infected/hijacked sometime within the past 10 days! Not sure what else may have been compromised in that time!!! Hope no site passwords have been snagged! BTW: In that followup test, whatever it was had also prevented Ghostery from showing me its report, so no question it was all up to no good! Nice. 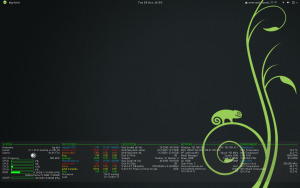 mind sharing the conky config?